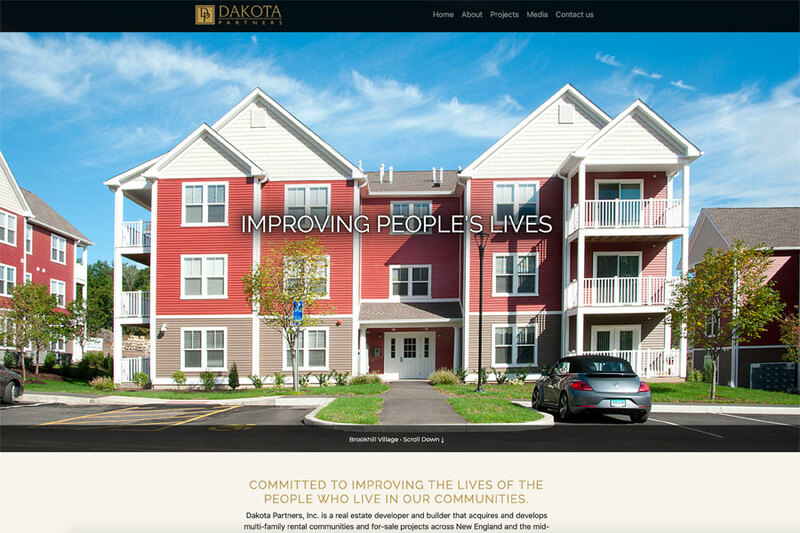 Dakota Partners sought a fresh website design and we delivered a new WordPress site with a robust property gallery that showcases their real estate development projects. We also photographed several of their properties to support the galleries for each one. Take a look! ELV Associates came to us for a website redesign to support their private real eatate investment and management firm. Our long term relationship with ELV allowed us to work closely with them on the project. The website has a clean, contemporary look and showcases thier impressive assets. Take a look! NetScout wanted a clean and concise cover wrap for their 10-K and Proxy Statement. By adding compelling visuals to the cover and introduction, we created a wrap that clearly communicates the company's key messages in a way that the shareholder can quickly understand. In addition to the printed version, we developed a state-of-the-art web version that includes enhanced content to the print companion. The report was successgful! To see more of the printed version, click here. You can see the companion web version here! For 2016, we focused on three new property acquisitions within FSP's core markets. The photography on the inside underscores the quality of their CBD assets. The report was another hit! To see more of the printed version, click here. We designed and developed a companion web version. You can see it here! A great new website with a CMS, professional photos of the company in action, including aerials of finished sites, are what we did to bring Family Paving's new website to life. An easy to use request a quote form, a place to post real time updates, and the ability to update content on the fly are just a few of the features included that allow Family Paving to leverage their website every day. To see more, click here. See it here! Muirfield Investment Partners wanted a website to support their private equity firm. Our extensive real estate experience coupled with our strong design and web development capabilities created a synergy for them to partner with us on the project. The result is a clean, contemporary website with simple beginings that is scalable as they grow in the future. We also worked on their branding and other collateral to support their marketing effort. Take a look! Lampiris CPAs was looking for a fresh design for their firm's website. We delivered a contemporary look and feel to the site, responsive design for mobile and tablet optimization as well as a CMS so they can keep the content current. We also handled all the technical development details to set up their hosting and two domains. Click here to see! The photos to the left were used as holiday cards for the Dana-Farber Cancer Institute. They have become very popular and successful cards. We have made prints available on our website. Click here to see! To visit the Dana-Farber website click here. When LaCascia's bought a new delivery van, they wanted to make a statement with it. We designed the vehicle graphics consistent with their branding so when people see it drive by, it will remind them of their great food and baked goods! To take a look, click here! The Irish American Partnership wanted an elegant and classic brochure to kick off their bequest program so they can continue to impact the future of Ireland by making directed grants supporting schools. Working closely with the Partnership, we designed this brochure where benefactors can set up legacy gifts to ensure good works for Ireland will continue long into the future. Quality digital printing combined with gold foil on the cover work to deliver the message and get the campaign moving forward. To take a look, click here! Floramo's sought a fresh web presence to better tell their story as Chelsea undergoes major new commercial and residential construction development, right in the heart of their restaurant's backyard. For more than 30 years, Floramo's has become a destination for the surrounding area with consistently fresh homemade food. We photographed their delicious meals and the restaurant itself to show the quality. Be sure to stop by next time you're in the area! To see the website, click here! Salem 66 needed an up-to-date website that reflects their quality auto service and sales business. We photographed their operations and organized a simple, responsive website with a CMS so they can keep their pre-owned car inventory up to date on-line. They have built a great reputation over the years and the new website underscores why so many of their customers are repeat customers. To see the website, click here! McLellan Brothers is a four generation marine service and sales company. They needed a web firm that understood their business in order to create a website that tells the right story of who they are. Mystic View Design was able to right the ship from a failed first attempt with a new website that hits the bulls eye. See the case study to learn more how we can help your business hit its mark by clicking here. To see the website, click here! Atlantic Tele-Network utilizes their annual report to communicate to a broad audience. In many cases the information contained in the report is useful to present new opportunities to prospects in the remote areas where they thrive. We separated their 10-K from the report so that they can leverage the report's use throughout the entire year. To see more, click here. We worked with Ramco Machine to develop a fresh, clean website that best represents their customized machine manufacturing plant. We photographed their products, highlighting the intricate details required to meet customer specifications. The new site is responsive and includes a CMS so Ramco can update their content in real time. Take a look! We worked with CSA Financial to develop a fresh, clean website that best represents their international leasing operations. The new site is responsive and includes a CMS so CSA can update their content in real time. Take a look! Our client needed us to photograph a newly acquired multi-building asset. We photographed the buildings' exterior and interior space, paying close attention to the quality of the space. There are more photos inside. Click here to see! NIRI Boston is an organization made up of professional investor relations practitioners. Maintaining their website regularly became tedious with third party maintenance and annual management changes. We redesigned their website and added a content management system, making it easy for anyone to keep the site current. Take a look! Franklin Street Properties wished to better showcase their impressive, growing real estate porfolio. We partnered with them to improve their website. We included a sophisticated property gallery that links to live google maps. Take a look! LaCascia's Bakery & Deli serves up a plethora of goodies and eats! We helped re-organize and present the food in a friendly and appealing way with new color schemes and in-house photography of their products. Take a look! © Mystic View Design, Inc.